Last week, everyone was insisting that the departure of Prime Minister Silvio Berlusconi would calm markets. On Wednesday, it became apparent that the opposite was true. After all, what comes next might be worse. Be careful what you wish for. That would seem to be the lesson from the events of the last several days in Rome. Both European Union leaders and markets had been exerting intense pressure on Italian Prime Minister Silvio Berlusconi to resign in recent weeks. Yet now that he has indicated a willingness to step aside, the uncertainty seems greater than ever. The most disturbing indication of the growing panic over Italy’s economic future is the soaring interest rates for Italian sovereign bonds. After hitting record highs earlier in the week, they briefly dropped on the news of Berlusconi’s imminent departure. But on Wednesday, yields on Italian 10-year bonds shot up again to 7.4 percent, eclipsing the Tuesday highs of 6.74 percent and leaping the 7 percent hurdle into territory that most analysts view as unsustainable. Italy is cause for particular concern because the country is the common currency area’s third largest economy. Bailing it out on the model of Portugal or Greece is likely not an option. Whereas EU leaders agreed to assist Greece to the tune of €130 billion ($177 billion) at a summit in October — meant to sustain it for several years — Italy will need to refinance fully €300 billion in debt in just the next 12 months. Its total debts stand at €1.9 trillion, or 120 percent of the country’s gross domestic product. Still, Wednesday’s jitters focused more on political realities in Rome rather than Italy’s macroeconomic indicators. And the reason for the sudden discomfort is twofold. 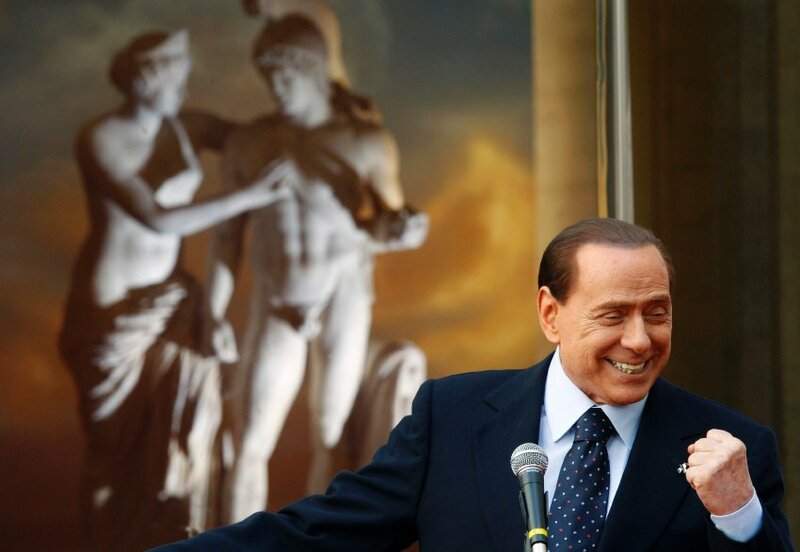 For one, Berlusconi is nothing if not a genius when it comes to clinging to political power. While the first reflex on Tuesday evening was one of euphoria, the full implication of the prime minister’s resignation offer quickly became apparent. He would, according to the announcement from the office of Italian President Giorgio Napolitano, stay in office until the austerity measures demanded by Rome’s European partners are passed. But there are many who won’t believe in a Berlusconi resignation until they see it. “Berlusconi is the supreme political maneuverer and no one will believe he has resigned until, yes, he has done so. Simple as that,” Jan Randolph, head of sovereign risk analysis at HIS Global Insight, told the Associated Press. The second reason for the concern, though, is perhaps more legitimate: People are worried about Italy’s future because they suddenly remember its past. Between the end of World War II and 1994, when Berlusconi was first elected as prime minister, Italy had almost five dozen governments, few of which survived much longer than a year and many much shorter than that. Political chaos was long an Italian trademark before Il Cavaliere was able to impose some order. With his end looming, the maneuvering has already begun in earnest. While the center-left in Italy, led by Pier Luigi Bersani, is calling for a national unity government, Berlusconi wants to see former Justice Minister Angelino Alfano take the reins. Others have spoken of a temporary government of technocrats tasked with getting Italy’s economic house in order. But Berlusconi and his allies have rejected the idea and would like to see new elections. A national unity government, he said, would be tantamount to an undemocratic “coup.” Hardly the kind of rhetoric that might indicate that major changes are just around the corner. For the moment, it looks as though new elections will be held in February, which could mean months of political turmoil in Rome and investor doubt in the world’s financial capitals. Even worse, it also would seem to reduce the chances that the euro-zone leaders will be able to scale up the currency backstop fund, the European Financial Stability Facility, as they agreed to do in late October. Part of that plan called for attracting investors to the fund from outside of Europe. But with ongoing political uncertainty in both Greece and Italy, investors have not proven eager to jump on board. Esse post foi publicado em Assuntos Internacionais e marcado Berlusconi, crise Italia, crise italiana, Italia, renuncia Berlusconi por Joanisval. Guardar link permanente.